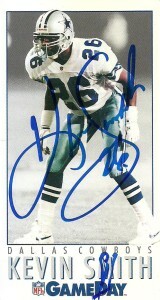 Occasionally I’ll see a paid signing I want to get in on the ground floor at, and although I had the pleasure of getting Smith on a previous opportunity at Dallas Cowboys Training Camp way, way back in 1992, there were still quite a few cards I had of him that I wanted to grace with his autograph. These 4 cards represent my favorite sets at that time. Action Packed had these embossed edges that really made the cards pop with the strength that symbolized football. Their smaller Rookies set was a no brainer for me since it was easier to collect on the stiff price point of 2.25 per pack that included 5 cards in it. GameDay was just a beautiful set. It pretty much embodied everything I liked but its most outstanding feature was the ‘tall boy’ look that made these cards look like game tickets. 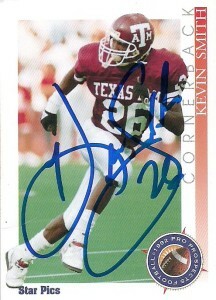 Star Pics was a good college card. Unfortunately they over anticipated demand for their product. They were quickly ousted from the market, but their 1992 set was a beauty from its clean white edges to the strong player photos. Skybox on the other hand made a late splash to an already clogged market. 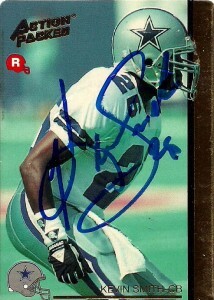 With ProSet, Topps, Upper Deck, Fleer, and Score all fighting for a slice of the pie along with these lesser names above, Skybox had carved a niche in the basketball market and set its sights on football. It’s 1992 and subsequent 1992-1993 set were absolute models of beauty and simplicity. The base impact set from 1992 with its bold type gives the card a very poster like feel, while its action photos are some of the clearest in the market from that period. I was really happy to get these 4 signed by Kevin. For the most part I’m pretty much done with the ex-Aggie and Dallas Cowboy, unless there is a free signing there I just happen to be at. An inductee of the Museum of the Gulf Coast, Kevin was not only a talented football player, but also a talented athlete playing basketball, baseball, and sprinkling in a bit of track too. During his time at A&M Smith during his Sophomore year intercepted a pass in every home game for the Aggies, including a 40 yard pick of LSU’s Tommy Hodson that Pup returned to the house. He finished that year with 9 interceptions. Kevin was named to the All-SWC team 3 times and played on some of the last great Aggie teams in the SWC before being taken by the Cowboys with their #1 pick of the 1992 draft. 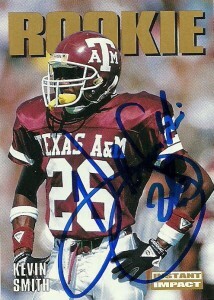 Injuries derailed what could have been an impactful career as Smith retired during the 2000 season, but he’s done a lot of things since including a brief stay as a color commentator for the Aggies.